Feeling adventurous, I set out some frozen salmon fillets in preparation for dinner last Sunday night. I had absolutely NO idea what to do with them. Are you surprised? Probably not. I mean, this is coming from the girl who grew up on red meat. Sure, I've mastered a yummy tilapia recipe, as well as a scrumptious mahi mahi one. Salmon? No way. This was all too new for me. Just like any other similar situation when I'm at a loss for what to do/make, I turn to the wonderful world wide web. With (and this is no exaggeration!) ENDLESS food & recipe blogs and websites out there, I knew it wouldn't take me long to find something. Surprisingly enough, I actually did have somewhat of a difficult time finding a nice marinade for salmon. I finally settled on a marinade from RecipeZaar. This was quite tasty, and I'll definitely make this again. For the record: this was not just my first time preparing salmon, it was also my first time EATING salmon! Wow. Do you have a favorite salmon recipe? Let me know! 2 (6 ounce) salmon fillets. In a medium bowl combine all ingredients, except for the salmon. Stir well. 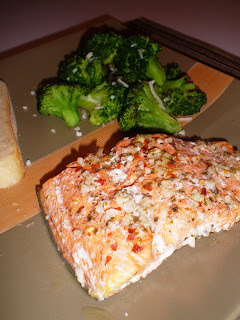 Place salmon fillets in a small baking dish. Pour marinade over fillets. Marinate in refrigerator for 1 hour - turning occasionally. Preheat oven to 375 degrees. Cover baking dish with foil - bake for 35-40 minutes (until easily flaked with a fork).